I wanted to address an infringement that's happened to a dear friend of mine who also happens to be a wing and crown maker. Angelia of On Gossamer Wings is someone who I have come to respect very much over the years, and even though we haven't met in person as yet, I consider her a good friend. We have even had to deal with a group infringement together (it was a pain, but we won). 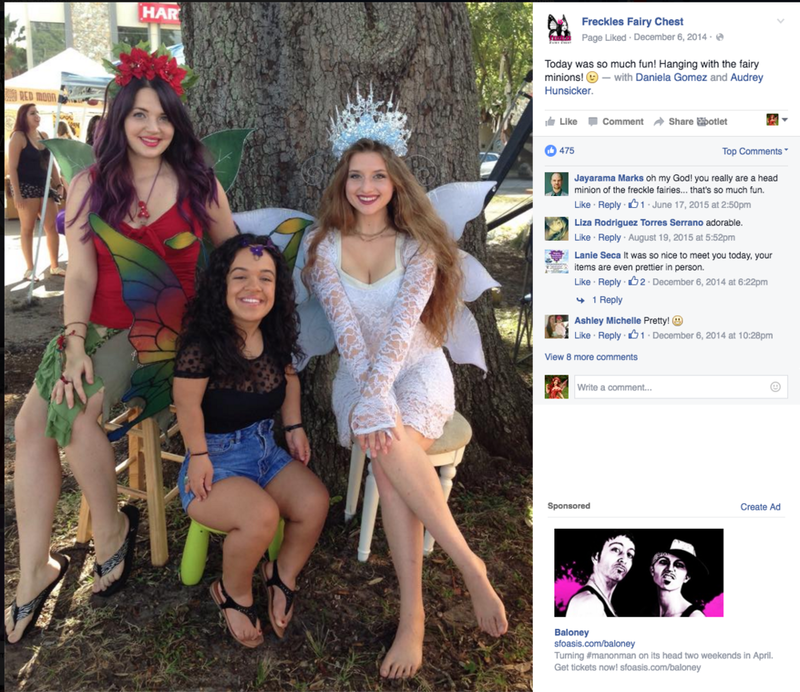 Some years ago she was also friends with Ashley Ormaza of Freckles Fairy Chest, who, after getting wing making advice from Angelia, mysteriously blocked her on social media without explanation. Angelia was given the silent treatment, except for an email out of the blue at one point where Ashley claimed she has forgiven her and moved on - forgiven her for what, we don't know because Ashley refuses to respond to Angelia's inquiries as to why. Since then, Ashley started her wing company, making product that would seem to follow Angelia's work. At first, nothing exact enough to make a fuss about, just enough similarities to take note of. However in 2014, Ashley approached a very popular fairy artist to procure a license to sell wings made after the wings in her Paisley Fairy painting. The problem is, the wing design in that painting was Angelia's. Jasmine Becket-Griffith was not aware that someone already was selling that design as she found the wing design in line art form on a tattoo parlor website. Being on the back of a fairy in a painting, Angelia did not have any issue with the painting and in fact was flattered. I had tagged her in the comments of Jasmine's post when I saw it and we both thought it was cool, but an artist with thousands of comments can't be expected to keep track of every single one. Ashley was not unaware of who that design belonged to in the slightest. She was very familiar with Angelia's work, having gotten personal help from Angelia, and she had shared photos of the wing style in question in the past as well. Below, Angelia's Crystal wings created in 2010, and a screen shot of Ashley sharing a photo of a necklace of the same design via her public Freckles Fairy Chest Facebook page when they were still on friendly terms. In 2014, soon after the Paisley Fairy painting was posted on Jasmine's site, a new post showed new licensed wings would be available that look like the wings in the painting - not licensed to Angelia's company as they should have been, but instead to Freckles Fairy Chest. I was floored, this really looked like a blatant attempt to steal another artist's IP. Thankfully, Jasmine had the contract dissolved immediately, and we found out that it was in fact Ashley that had approached Jasmine to produce the wings. Angelia did not speak out about it, due to the large following that Ashley had gained, but it was definitely hurtful and I was impressed with her ability to keep it under wraps. At least the wings weren't being produced, at least as far as we know. Below, the post about the licensed wings (deleted from FB since the contract dissolved) along with a screen shot from Ashley's public business page showing a photo of one of her friends or employees wearing an even closer copy of said wings. Was the more accurate copy what she had planned to ship out to customers, assuming that very slight changes to the ones in the license announcement would make it okay? We'll never know, but even if that is not the case, the only person with the right to that wing license would be Angelia. After that, Ashley launched a new makeup business, and wing making seemed to not be a focus anymore, though she still sold crowns. Angelia had made a crown that she included in one of her wing photos on a mannequin in 2016, but had not yet listed for sale. Some time later, Ashley made a strikingly similar crown which she would then sell through her Etsy site, before Angelia even had a chance to. It's one of her simpler designs, however in that case making it unique should have been easy to do. A few variations popped up as well, including on the cover of Faerie Magazine, however the first one is the most similar. Below, the first and second posts Angelia made of her crown in 2016, alongside the post from Ashley's public business page of the one she made. Angelia has finally now offered it for sale (the first one sold but more will follow) and made clear that she had made hers first, and that another artist had been selling a copy of it. It's unfortunate that Ashley has cut off communication with Angelia, even more unfortunate that she felt compelled to act out in this way, but it is my hope that maybe someday she will come to acknowledge her behavior in the past and present and perhaps offer an apology. As of yet, there has been none and I'm sad to say I have my doubts that one will be offered. I would be happy to be proven wrong. Personal and professional integrity is important. Artist's rights are important too, and I have always been vocal about that. I decided to make this post with all facts included, because I was accused of lying about the matter and challenged to prove the allegations by a family member of Ashley's.